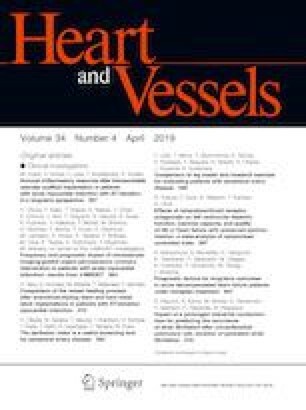 Previous studies have demonstrated that use of intravascular ultrasound (IVUS) during percutaneous coronary intervention (PCI) was associated with lower incidence of death, myocardial infarction, and target vessel revascularization. Recently, optical coherence tomography (OCT) has emerged as an alternative intravascular imaging device with better resolution. The aim of this study was to investigate frequency and prognostic impact of IVUS or OCT-guided PCI during urgent revascularization for acute myocardial infarction diagnosed by the universal definition. A total of 2788 patients who underwent urgent PCI were selected from a multicenter, Japanese registry of acute myocardial infarction diagnosed by universal definition (J-MINUET). Frequency, clinical characteristics and prognostic impact of the IVUS-, or OCT- guided PCI were investigated. Clinical endpoint was in-hospital death. Angiography-, IVUS-, and OCT-guided urgent PCI were performed in 689 (24.7%), 1947 (69.8%), and 152 (5.5%) patients. In-hospital death in each group was 10.4%, 5.1%, and 3.3%, respectively (P < 0.01). By univariate and multivariate logistic regression analysis, IVUS-guided PCI (vs. angiography-guided PCI, OR 0.49, 95% CI 0.30–0.81, P = 0.006) was a significant independent predictor of in-hospital death. Intravascular imaging guided-PCI was frequently adopted during urgent PCI for acute myocardial infarction diagnosed by universal definition and was associated with better in-hospital survival. The J-MINUET investigators are listed in Acknowledgements. This study was supported by the Intramural Research Fund, Grant number 23-4-5, for Cardiovascular Diseases of the National Cerebral and Cardiovascular Center. The authors thank all the enrolled patients, participating cardiologists, medical and other staffs who have contributed to this study. The J-MINUET investigators are listed in Appendix. J-MINUET Investigators: Masaharu Ishihara, Hyogo College of Medicine; Ogawa Hisao, National Cerebral and Cardiovascular Center, Kumamoto University Graduate School of Medical Sciences; Nobuaki Kokubu, Sapporo Medical University; Tadaya Sato, Akita Medical Center; Teruo Inoue, Dokkyo Medical University; Shigeru Oshima, Gunma Prefectural Cardiovascular Center; Hiroshi Funayama, Saitama Medical Center Jichi Medical University; Ken Kozuma, Hiroyuki Kyono, Teikyo University; Wataru Shimizu, Nippon Medical School; Satoru Suwa, Juntendo University Shizuoka Hospital; Kengo Tanabe, Mitsui Memorial Hospital; Tetsuya Tobaru, Sakakibara Heart Institute; Kazuo Kimura, Yokohama City University Medical Center; Junya Ako, Kitasato University; Mafumi Owa, Suwa Red Cross Hospital; Yasuhiro Morita, Ogaki Municipal Hospital; Yukio Ozaki, Fujita Health University; Satoshi Yasuda, Teruo Noguchi, Masashi Fujino, National Cerebral and Cardiovascular Center, Junichi Kotani, Osaka University Graduate School of Medicine; Takashi Morita, Osaka General Medical Center; Atsunori Okamura, Sakurabashi Watanabe Hospital; Yoshihiko Saito, Nara Medical University; Masaaki Uematsu, Kansai Rosai Hospital; Hiroyuki Okura, Kawasaki Medical School; Atsushi Hirohata, The Sakakibara Heart Institute of Okayama; Yasuharu Nakama, Hiroshima City Hospital; Keijiro Saku, Fukuoka University School of Medicine; Seiji Hokimoto, Kumamoto University Graduate School of Medical Sciences; Koichi, Saiseikai Kumamoto Hospital; Kazuteru Fujimoto, National Hospital Organization Kumamoto Medical Center; Yoshisato Shibata, Miyazaki Medical Association Hospital; Kazuhito Hirata, Okinawa Prefectural Chubu Hospital. Yoshihiro Miyamoto, Kunihiro Nishimura, Michikazu Nakai, National Cerebral and Cardiovascular Center. Grant This study was supported by the Intramural Research Fund, Grant number 23-4-5, for Cardiovascular Diseases of the National Cerebral and Cardiovascular Center.